The stage is set for festive gatherings and your dining room table is the star. Discover just how bright the table can shine with a revolving cast of brilliant details. Striking poinsettia china poses pretty on black chargers with tree-shaped napkin folds. Fresh cut boxwood form a wreath surrounding a large glass urn filled with shiny red ornaments; while the soft flicker of candlelight glows with radiance and dances about the room. Get ready for a curtain call you will certainly get rave reviews. The poinsettia dinnerware has been in my family for several years and plays a leading role for this table setting. This seasonal setting has complimentary serving pieces that can be used for floral containers, Christmas ornaments, and displayed. The dinnerware is too decorative for food service instead it is used for display during the holiday season. When guests arrive the table is set with the decorative plates so they can enjoy the festive table; however the dinner is served on classic white china. You can place the classic white dinner plate over the top of the decorative if you desire or remove the plate during the appetizer. With pretty linens and the classic white china you only need to supply some shimmer with ornaments, fresh greenery, and a few candles to make your table holiday ready. 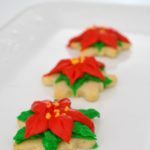 Poinsettia decorated butter cookies play a title role for each dinner guest. They can be eaten before the dinner or packaged as a take home favor. These small delicate cookies are snowflake cutout shapes that bake the same size you cut them. They are frosted with red and green buttercream frosting and piped into large leaves resembling a singular poinsettia. The cookies can be baked a few weeks ahead and frozen with out frosting. The frosting can be made ahead and kept in the refrigerator in disposable piping bags until ready to use. “Too pretty to eat” will be a cue that your baking skills are appreciated. Another cast member of this setting includes the tree-shaped napkin fold. It begins with a large 20 x 20 napkin folded in half and half again to form a square. The outside edges are loose and layers of folds are tucked under each layer to form the tree shape. Stand the napkin upright in front of the setting or add a tiny red bow to the top of the tree and a pretzel stick for a trunk and lay the napkin horizontal on the dinner plate. The superstar of this holiday table is the boxwood wreath centerpiece. The wreath provides the base for a large glass urn filled with shiny red ornaments that glisten in the soft glow of candlelight. The traditional red and green Christmas color scheme draws our attention center stage and supports the festive and merry season. The boxwood wreath can perform multiple roles this season; as a centerpiece, hung on windows, banisters, above the fireplace or on the front door. Boxwood is an evergreen shrub that is ideal for sculpting, manicuring or left free growing. The foliage is small green cloud’s almost waxy but firm. Because of the firmness of the stems you can stick the cut stems directly into floral foam without the use of wire. Boxwood is mildly fragrant which adds to the fresh scents of Christmas and will not interfere with the aroma of your dinner. The wreath is made with a 15” round caged Oasis florist foam that is soaked in water. Fresh boxwood stems were cut into 6” lengths and inserted into the oasis foam going in a circular direction so the stems are balanced making the circumference of the wreath 20- 26”. Depending on the size of your dining table you can adjust the fullness of the wreath with the clippings. Not to upstage the star and standing on both sides of the wreath centerpiece are several white candles. Two glass canisters are filled with standing stems of boxwood around a pillar candle. The stems are not in the region of the flame. If you prefer, you can use the flame-less candles with the boxwood stems. If you don’t have boxwood growing in your yard you can use magnolia, Frazier, pine or other evergreen type foliage. Mixing the evergreen foliage adds texture and makes a beautiful wreath. It’s almost show time and family festivities for the Christmas season begin with a spectacular dining table. Orchestrate the cast and crew to help with the decorating details. Not only will the table be a shining star but you will be too! So take a bow and get ready for a standing ovation! Recipe for butter cookie on this page. Cream together the butter and vegetable shortening. Add in half & half, vanilla and ¼ cup powdered sugar. Beat until creamy add remaining confectioner’s sugar. Separate frosting into three bowls with ¼ cup frosting tinted yellow, divide the remaining frosting in half, tint one half with leaf green and the other half with soft pink and super red. Stir to combine. Cover frosting bowls with plastic wrap and allow to rest at room temperature over night to deepen the colors. Fill red frosting in disposable decorating bag fitted with large leaf tip # 366. Fill green frosting in disposable decorating bag fitted with small leaf tip #352. Fill yellow frosting in disposable decorating bag with small clip off end of bag, no tip necessary. Cookies can be baked ahead and frozen up to 6 weeks before frosting. Best results frost before serving. Red gel will stain. We suggest using a standing mixer to prepare this dough. Cream sugar and butter until fluffy, about 5 minutes. Add eggs and flavoring. Mix dry ingredients in separate bowl and add to butter mixture. Put a handful of the freshly made dough between two sheets of parchment paper and roll to desired thickness. Repeat with the rest of the dough. Put the rolled dough, including the parchment paper on a cookie sheet and refrigerate for 10 minutes or longer. Your dough will be chilled and ready to cut and bake with no wait and no added flour! Repeat the process with scraps after cutting cookies. Bake at 375 degrees for 8-10 minutes. Let cool on rack. This dough will not spread while baking and is perfect for cutting out various shapes and sizes. Double the recipe to make up to 8 dozen. Baked and frosting free-cookies freeze well. Recipe inspired by Karen’s cookies. Liz Bushong is an expert in the three-dimensional art of entertaining. She transforms simple dining occasions into beautiful and memorable moments by adding a touch of her own “sassy style”. For the past several years Liz has been entrusted to decorate several high profile homes for the Holidays including the White House, Vice Presidential Personal Residence, Governors mansions and more. She is a featured monthly guest chef/designer on regional CBS/ABC Affiliates Daytime Tri-Cities, Daytime Blue-Ridge Roanoke and other television shows. Liz is the author of Just Desserts and Sweets & Savories cookbook as well as a writer for several magazines including VIP SEEN & Lovely Bella.